If you love this free crochet pattern, Save it on Ravelry!! Click Here…. 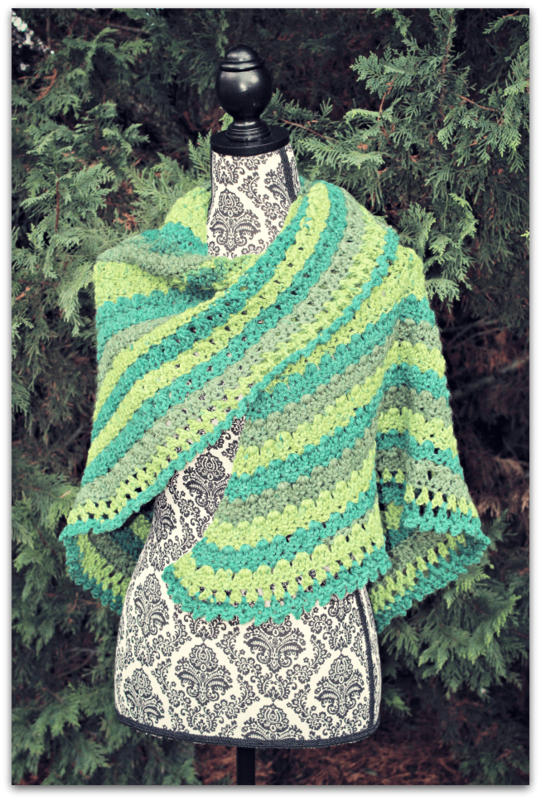 I fell in love with this green, self striping yarn by Premier Yarns… I had so much fun working with it and creating this triangular shawl… I hope you love it too!! This is Sweet Roll in Mint Swirl. Yarn: 3 Premier Yarns Sweet Roll in Mint Swirl (245 yards each) or 735 yards of any worsted weight yarn. Ch 3, join to make a ring. Finish off & Block into shape. Congratulations!! You now have an Amazing Grace Lucky Green Shaw!!! Oh I love your Shawl for the Premiere Sweet Roll yarn! I am so glad you used this colorway! It’s so pretty! I hadn’t realized that it was such bright greens from retail sites pics. It’s gorgeous and perfect for spring! I just finished a shawl in the Black Pepper colorway and am officially in love with the Premiere Sweet Roll yarn, and can’t WAIT to get started on my next one! This one will be using your beautiful pattern! I don’t have the green on hand, but I have the “frosty”, so the first shawl won’t be green. 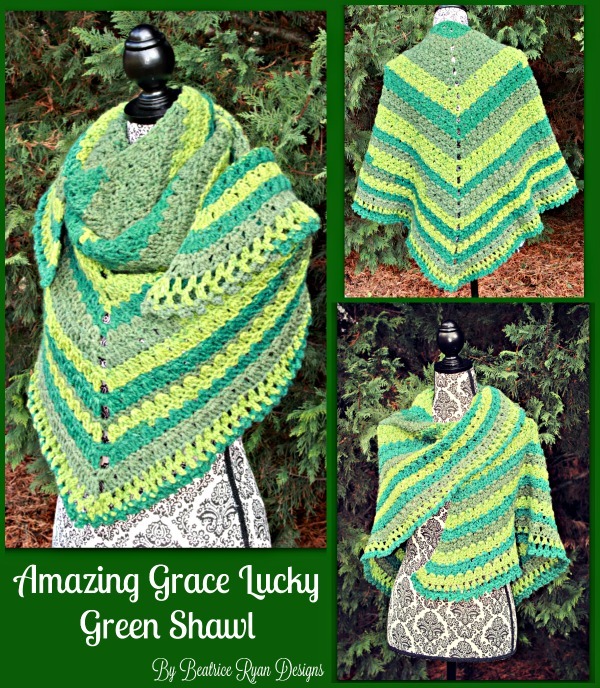 but I love your green shawl so much I’m going to buy the yarn and make a second shawl using this pattern! Just gorgeous! I’m considering pretty light pink dangling flowers for the border… Like spring! Thank you! Row 6 and the other evens after, I’m not getting the right count. I only count 15 (sc ch sc) not 16 ….. am I missing something? There should should have been a repeat of 4 times on the second half… all fixed.